Are you looking for a last minute SPOOKY LOOK for Halloween? All you need is a good makeup and let your creativity do the rest. Make a comic of yourself with some nice white dots POW!!! so funny! 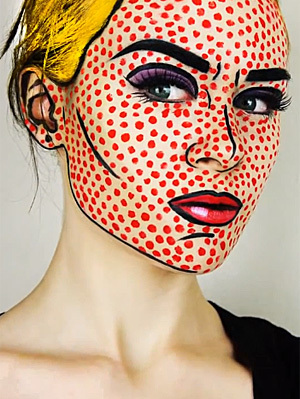 For the makeup, here is a very nice tutorial by Emma Pickles. We all want to be Anna! Who if not Vogue America’s editor-in-chief Anna Wintour? All you need is a blonde bob, some Prada black sunglasses and oh! Yes! …..the latest issue of Vogue Magazine, off course. There is always one, the dark queen! Whether you are more like Queen Ravenna in Snow White and the Huntsman or Maleficent, just wear your corwn! Every lady needs a crown, don’t you think?